Nati Harnik/APWarren Buffett attends the annual meeting of Berkshire Hathaway shareholders in Omaha, Neb., on Saturday. NEW YORK -- Billionaire investor Warren Buffett defended some of his core holdings in a televised interview Monday, but reiterated that equities in general would look expensive in an environment with normal interest rates. The remarks from Buffett, chairman of Berkshire Hathaway (BRK-B), come as several of his core holdings, including IBM (IBM) and Coca-Cola (KO), have showed declining revenue trends in recent years. Buffett told CNBC that Berkshire had bought more shares of IBM during the first quarter, and forecast higher earnings at the company over the next 10 years. He also praised IBM's stock buyback program, which he said had been "enormously beneficial" for shareholders, though he stressed that in general, buyback programs should be done based on share price and not as an all-purpose strategy. Coca-Cola continues to have a "strong competitive position," he said. Referring to the broader market, Buffett said equity valuation would appear "on the high side" if interest rates were normalized from their currently low levels, while U.S. bonds currently appear "very overvalued." 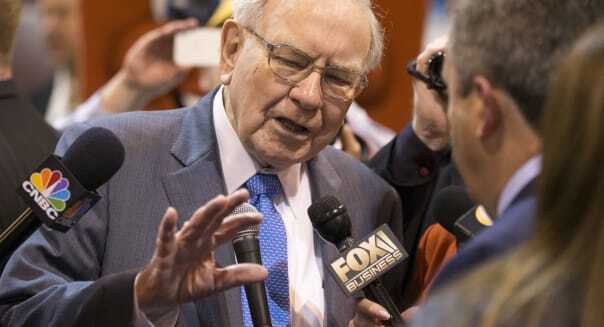 The comments on equity valuation repeated remarks he had made over the weekend at an annual Berkshire Hathaway meeting. While he acknowledged that investors expect interest rates to rise this year, Buffett said it would be difficult for the United States to raise rates "significantly" if European rates remain low. U.S. Federal Reserve Chair Janet Yellen's "hands are somewhat tied" by European Central Bank President Mario Draghi with respect to interest rates, he said. Buffett also commented on the recent strength in the U.S. dollar, as well as the state of the eurozone, two key issues for Wall Street investors. He predicted that the European Union "more likely than not" would exist in 20 years, though it could have different members than it currently does, a possible reference to Greece's current difficulties. Speaking about the dollar, Buffett said that given a choice between the U.S. dollar and a basket of other currencies, he would prefer the dollar over the next 10 years. Bill Gates, founder of Microsoft (MSFT) and a Berkshire director, told CNBC he would prefer the Chinese yuan over the same period of time.